The President’s new Framework for Business Tax Reform is two documents in one. 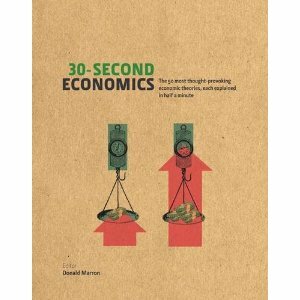 The first diagnoses the many flaws in America’s business tax system, and the second offers a framework for fixing them. Much of the resulting commentary has focused on the policy recommendations. But I’d like to give a shout out to the diagnosis. The White House and Treasury have done an outstanding job of documenting the problems in our business tax system. As the Framework notes, our corporate tax system pairs a high statutory tax rate with numerous tax subsidies, loopholes, and tax planning opportunities. Our 39.2 percent corporate tax rate (including state and local taxes) is the second-highest in the developed world, and will take over the lead in April when Japan cuts its rate. But our tax breaks are more generous than the norm. That leaves us with the worst possible system – one that maximizes the degree to which corporate managers have to worry about taxes when making business decisions but limits the revenue that the government actually collects. It’s a great system for tax lawyers, accountants, and creative financial engineers, and a lousy system for business leaders and ordinary Americans. Far better would be to fill in the Swiss cheese of the tax base and move to a lower statutory rate, just as the President proposes (albeit with much more clarity about the rate-cutting than the cheese-filling and with proposals that would make some of the holes bigger). I am at a loss to understand why the tax system should favor utilities, mining (which includes energy extraction), and leasing, while hitting services, construction, and wholesale and retail trade so hard. Why should the average retailer pay 31%, while the average utility pays only 14%? These disparities are unfair and economically costly. Investors recognize these differences and allocate their capital accordingly. More capital flows to industries on the left side of the chart and less to those on the right. Far better would be a system in which investors deployed their capital based on economic fundamentals, not the distortions of the tax system. 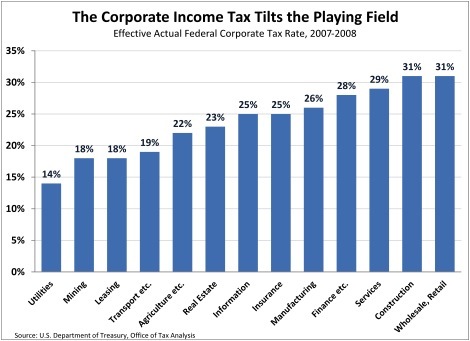 The chart highlights one of the key battlegrounds in corporate tax reform. Leveling the playing field (while maintaining revenues) will require that some companies pay more so others can pay less. The U.S. Chamber of Commerce announced Wednesday that it “will be forced to vigorously oppose pay-fors that pit one industry against another.” But such pitting is exactly what will be necessary to enact comprehensive corporate tax reform. P.S. The full names of the sector names I abbreviated in the chart are: Transportation and Warehousing; Agriculture, Forestry, Fishing, and Hunting; Finance and Holding Companies; and Wholesale and Retail Trade. I have seen tax reformers advocate having 0 corporate taxes and tax personal interest and dividend income at ordinary tax rates. Would such a plan be revenue neutral and what arenyour thoughts on fairness and economic impact. Getting rid of the politics of the tax code would certainly be a major plus.